Starring: William Sadler, Thierry Lhermitte, Eric Godon, Philippe Nahon and Andre Valardy. Introducing Alan Barnes Netherton and Naama Kates as Delilah. A pair of twins named Blue and Delilah (newcomers Alan Barnes Netherton and Naama Kates), separated at birth, meet for the first time at their mother’s death bed. Their mother (Debbie Rochon, Skeleton Key, Nowhere Man) tells the twins that it is their fate to fulfill a secret prophecy. The prophecy foretold long ago that they would avenge her death by killing the dark sorcerer Chambers (William Sadler, “The Pacific”, The Shawshank Redemption, Eagle Eye). The only problem is that Chambers is their father – and in a month from now, he’ll have the last gruesome ingredient he needs to become immortal. As time runs down, the twins chase Chambers across the world from the corpse-filled catacombs of Paris to the most sacred rituals of the Muskogee Indians in Oklahoma. Along the way, they have to do battle with Chambers’ vast army of followers, bringing them face to face with the Mayor of Paris (French superstar Thierry Lhermitte, The Dinner Game, Little Indian, Big City), the Greek god Hermes (Eric Godon, In Bruges, From Paris With Love), a street magician whose frightening tricks are real (Philippe Nahon, High Tension, Irreversible), and an immortal king with a castle hidden high in the mountains of Belgium (Andre Valardy, The Goat, American Dreamer). Nothing Sacred is the second film for Dylan Bank and Morgan Pehme, the filmmakers of IFC Films’s 2009 release Nightmare. 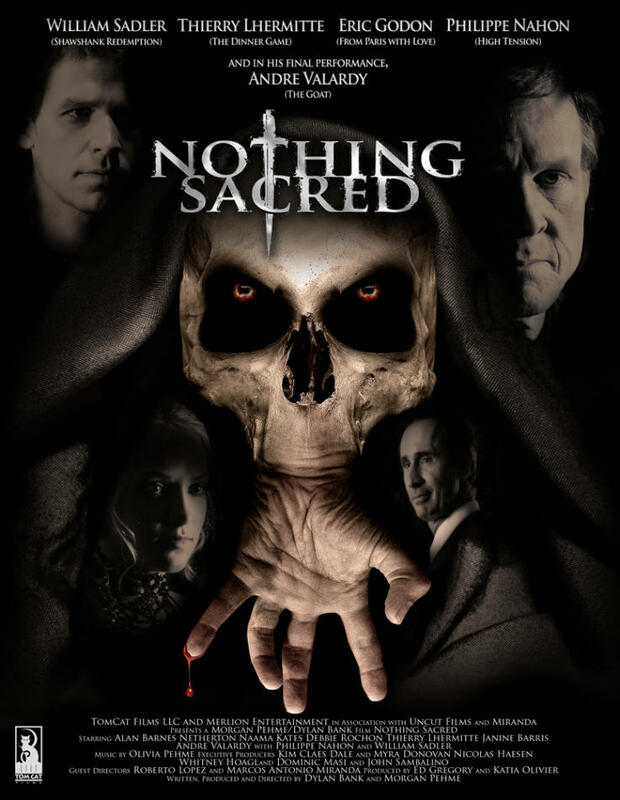 Like Nightmare, which won 15 film festival awards including Best Picture and Best Director at the Chicago Horror Film Festival, Nothing Sacred is shot in HD with a striking aesthetic that combines dreamy colors and gritty intimacy. Take a journey through the ancient world of magic and monsters hiding among us. A world that threatens to destroy our own if Blue and Delilah can’t track down their father and kill him before he becomes immortal.